How do you let go of attachment to people and things? How many happy faces do you see around you every day? Think about it. Now, look to yourself. What makes you happy? What makes you sad? If you look at the things that make you happy, are they possessions, objects, people, milestones? Figure out what makes you happy and unhappy. For me, books, music and traveling make me feel on top of the world. 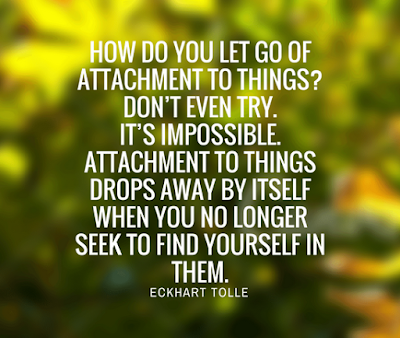 Do you become easily attached to people and to things? Do you feel crushed or hurt when all your sincere effort in relationships does not bring you an iota of happiness? You feel like you are the one who is always trying but no one's there when you really need some one? If any of this makes sense to you, trust me: I know how you feel. Okay, lets get to business, shall we? What works? 1. Pray your heart out. 2. Listen to soothing music. Make it peppy, not tragedy! 3. Read a book. Make sure you don't hold it upside down! 4. Bake something for your loved ones - this completely takes your mind off whatever is worrying you. Because no one, I mean that, wants to clean a burnt oven! 5. Talk to some one you really trust. Meditate. Visualize whatever or whoever has hurt you. Step back from it. More importantly, step back from the emotion driving your hurt. Hold that up to a blazing flame of God's love in your heart. Be detached - that is the key! Offer that hurt to the flame - let it go, simply let go of it. You are free. You don't have a reason to feel angry anymore. If that feeling persists, remind yourself that you aren't emotionally connected to that moment anymore. Best of all, you will feel that your heart is sparkly-squeaky clean and cleansed from within. And nothing beats that feeling, I tell you, when it comes from within! DO READ: ASK MORE, FEAR LESS. Labels: how do you let go of attachment to people and things? Glad to know that my blog is a source of solace in the Internet jungle. I am not an expert on prayanama and its link in awakening of Kundalini but if I read something interesting about it, I will definitely write a blog post on it. Thanks for the idea!